Though plates had many changes between 1927 and 1994, I decided to group their history in this broad time in just one page because they always kept the same numbering format and therefore changed only the look. For this reason, first of all I'll show the numbering system and then, later in this page, you'll find how the look of the Italian plates changed in the years. All plates till 1994 had two letters as origin code (see table) and a serial number up to 6 digits with eventually one letter and there has never been any kind of vanity plate. The first series was from 0 up to 999999, so just 6 numbers, with no leading zeros, so the digits could be less than 6 (pictures number 1, 2 and others). Actually leading zeros started being introduced in the 1960s for the new provinces: for Pordenone (1967) and for Isernia (1970) the plate had at least 4 digits (click here to see the plate PN 0001), for Oristano (1976) at least 6, even if strangely after the plate number OR 009999 the number OR 10000 was issued, so without the leading zero (click here to see the pictures). At last from 1985 every plate had 6 digits: anyway this last change interested only a few provinces with less cars (Isernia passed from 48000 to 048001, Enna from 94000 to 094001 and Oristano from 54000 to 054001) or created later (pictures number 14 and 15: PO stands for Prato and VV for Vibo Valentia and in fact they both were created in 1992) and was made to avoid "holes" in the plate that made it easily editable. 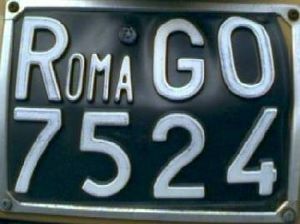 Actually a leading zero was also used on plates from Rome for diplomatic plates between 1936 and 1944. When the 6 numbers series was exhausted a letter was introduced in the first position: A00000 (pictures number 8 and 11). In this series the letters C, I, J, O and Q were skipped and the letters X, Y and W followed the letter Z in this order. If you want to see the picture of the first Italian plate of this series (issued in Milan), click here. In some provinces this was not enough and a new series was issued with letter at the end: 00000A (picture number 11). In this case also the letters B, K and U were skipped, while all the remaining letters were in the correct alphabetical order. In the two biggest provinces (Rome and Milan) it was then issued a new series with a letter in second position: 0A0000 (picture number 12). The third largest province (Torin) did not finish the previous series. In this series, beside the letters skipped in the first alphanumerical series, also the letter B was skipped. 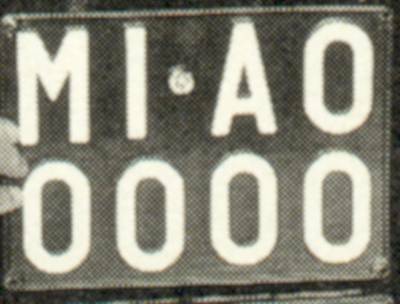 Milan was the only province that ended the previous series, so a new one with the letter in third position was issued: 00A000 (picture number 13). The letter D was reached, skipping both the letter B and the letter C.
David Urios Mondéjar has made a table with the date of the beginning of each new series: click here to see it. 1932-1943: in 1932 some changes were made to rear plates and they became made of two lines: the origin code with the first two digits of the number were placed on the top line, while the other 4 digits were on the bottom (picture number 5). The sides of the plates were about 10 x 7 inches long. 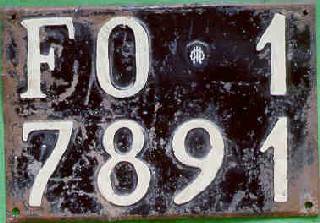 In 1934 also front plates were changed: the colours were the same used for rear plates, with white characters on black background, their size was very small (about 10.5 x 2.3 inches) and CONI (it stands for "Comitato Olimpico Nazionale Italiano", Italian National Olympic Committee) started making them. The funds raised with these plates were given to CONI and for this reason there was the print "CONI" in a rhomboid frame (picture number 6). 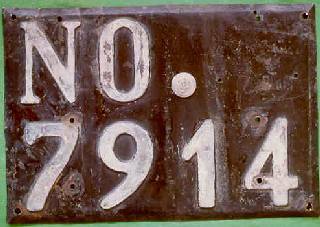 Between 1932 and 1934 all the plates previously issued were replaced with new ones, even if they kept the same number. For this reason the plate in picture number 7 as got the appearance of a plate of 1932, even if it has the number 1! Differently, the plate shown in the picture number 6 has got the number 1 because the province of Asti (AT) was created in 1935! I want to thank Giancarlo Raposo for the picture number 6. 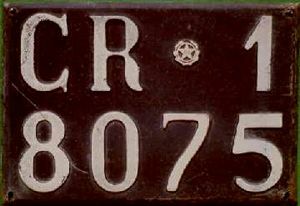 1943-1945: very few passenger plates were issued in these years because a law prohibited buying new cars due to the current war. 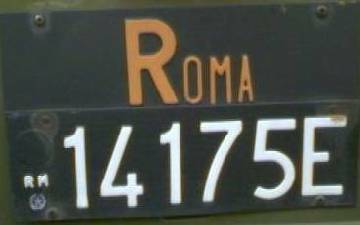 Anyway I'm aware of some plates issued in those years (for instance there were 20 new plates in Cremona in 1943 and 1944), even if probably to institutions and organizations or for vehicles that had lost the original plate or changed province. Many thanks to Guglielmo Evangelista for these details. 1945-1948: after the Second World War and the end of fascism in Italy, the symbol of fascio was removed from the license plates and substituted by the symbol of the Associazione Mutilati e Invalidi di Guerra (Association of disabled men of the war): it was a thorn crown with three bayonets inside (picture number 8) and the funds raised with these plates were given to the association for disabled men of the war, exactly as it happened with front plates for CONI. Anyway this was the only change that was introduced. Nothing else changed in those years, but slightly the symbol of CONI. 1948-1976: in 1948 the symbol of the Italian Republic was introduced on either front (picture number 9), either rear Italian plates: it is a star with 5 ends inside a garland with the letters RI in the middle, where RI means "Repubblica Italiana" (Italian Republic) and you can see it in all the pictures from this point on. Between 1949 and 1951 this coat of arms had a significantly bigger size than after 1951, as you can see in picture number 10. Moreover in 1951 there was a change also in the character, from a "Garamond" (picture 10) to a linear font (picture number 11): the easiest way to see this difference is in the number "4" that is closed before 1951 and then open. From 1959 plates could be made with other materials than metal (picture number 10) and then, since 1963, they started being made of plastic (picture number 11), but this made them much weaker and they could easily be damaged or change their shape and aspect as you can see in pictures. In this site it's also possible to see a picture of the delivery of the first plastic plate in the old photo gallery (picture number 22). 1976-1985: in 1976 many changes were introduced on the rear plates, while front plates kept their previous look. First of all they were made of two different parts: the first one had the origin code, while the second the serial number of the plate and a 1" diameter embossed circle (for a sticker that was not introduced!) over the very small provincial code letters over the Italian Republic seal (picture number 12). In this way the plate could be arranged in one line (picture number 12) or in two lines (picture number 13), simply changing the first part of the plate that was not official. The height of both parts is 4.3 inches; the total width of the plate is 21.5 inches if arranged in one line and 13.2 inches if in two lines. Moreover the colour of the origin code on rear plates became orange (picture number 12). Front plates didn't change at all. The list of the starting number of this new format for each province is available and you can see it simply clicking here (only in Italian). I have to add that in 1977 a totally new numbering system was proposed but it was never used: the aim was to allow a higher number of combinations and this was possible changing the origin code of the main provinces at the end of each series. On this web site you can find the text of the Decreto Ministeriale of 25/6/1977 that describes this new system: if you want to read it, click here (only in Italian). 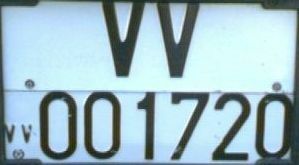 1985-1994: the last change for these plates was made in 1985 to improve the legibility. All the plates became with black characters on reflective white background (pictures number 13, 14, 15 and 16) and front plates, that had remained very small since 1934, were enlarged (about 10.5 x 2.3 inches... picture number 14). Moreover due to the problems of the plastic, metal was used again to manufacture plates. Anyway there were not other changes and rear plates continued being made by two different parts. The list of the starting number of these new plates with reflective background for each province is available and you can see it simply clicking here. Moreover Marcello Taverna made an unofficial list of the highest number seen in each province: if you want to read it, click here.